Romach und Haas brings several antique and well-designed cuckoo clocks at your doorstep, just as this Cuckoo Clock with Birds. It is a stellar accent that has an 8-day movement and comes with a shut-off switch. Crafted in Germany, with this hand-carved piece you can add a quirky dazzle to your home. It is an eclectic piece that oozes old-word charm in every inch. 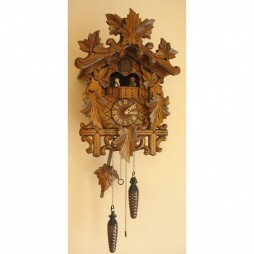 This Cuckoo clock measures 12 x 15 x 7 and is ideal for hallways and fireplaces. 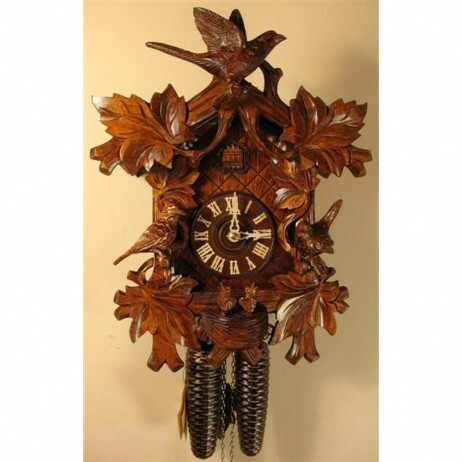 Create a mystical ambience in your home with this clock that has ornate maple, vines, birds and nest carvings. This large and beautifully-carved cuckoo clock speaks of old-world charm and craftsmanship. 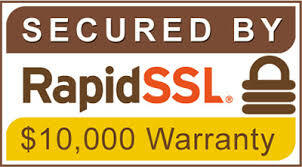 It features a beautiful and detailed carving of three birds which are hand-carved in three dimensions. The little birds are incredibly lifelike and stand guard over their young nested in the thicket of grape leaves. When the clock strikes the hour or half-hour the door opens, a cuckoo appears and calls along with the clocks gong strike. Even the packaging has old-world charm, as only paper is used. The factory packing is all made with renewable materials. 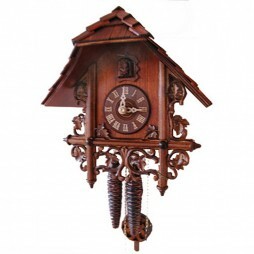 Bring in the true colors of style and panache into your home with the German Feeding Birds Cuckoo Clock. At every strike of the hour, the door pops out and the cuckoo appears with a clock gong. This wooden clock is a masterpiece that plays a soothing melody on your walls. The clock has a unique design. Its mechanical brass movement stands as the testament of its precision. 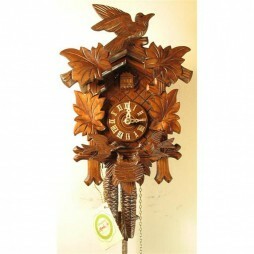 With a 2-year warranty, this hand-carved clock comes with a shut-off switch for the cuckoo call. It is a German piece of watch-making craft that can bring you home to a new life. German Cuckoo Clock with One-day Movement is a bestseller from the house of Rombach und Haas. 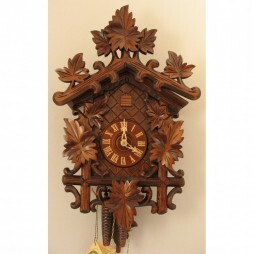 The Bahnhausle frame of this clock features a hand-carved maple leaf design that is crafted from solid Linwood. It is an exemplary German clock that sends out a cuckoo to please you at the strike of the hour. Also, it has a notable gong sound that’ll bring every corner of your room to life. Talking about this mechanism, the clock has a shut-off switch and comes covered with a 2-year warranty. The mechanical brass movement of the clock keeps the pendulum of the clock accompanied. Get this masterpiece at an affordable price right away!